The Brad Wuhs Pro-Pro and Education Forum takes places Monday, May 7 at the Hyperion Field Club. The education forum will be a town hall discussion on the Iowa PGA Section’s tournament program that will begin at 9:00 a.m. The tournament will start with a shotgun start at noon. This event will include teams comprised of two Iowa PGA Professionals competing in an 18-hole – 1 best ball of 2 format. There will be a Low Pro individual event with an Open Division, Senior Division and Super Senior Division. The Brad Wuhs Pro-Pro and Education Forum is an 18-hole Minor Point Event. Click here to view teams and general information. The Spirit Hollow Spring Junior Tour Classic is this Saturday and Sunday, May 5-6 at the Spirit Hollow Golf Course. Saturday’s round will start at 11:00 a.m. All groups will go off the first tee for the first round. The second round will start at 10:00 a.m. The 9-hole age divisions will go off #10 on Sunday morning. The Boys 11 & under and Girls 13 & under age divisions will play nine holes, while all other age groups will play 18 holes. Click here to view tee times and pairings, and general information. The NB Golf Cars/M&M Golf Cars Foundation Pro-Am is the next event on the Iowa PGA Professional schedule. The Foundation Pro-Am takes place on Monday, May 21 at the Davenport Country Club. Registration for the NB Golf Cars/M&M golf Cars Foundation Pro-Am is open and will remain open until Tuesday, May 15 at 11:59 p.m. Click here to register. The Junior Spring Series concludes next weekend with the Iowa PGA Junior Spring Series #2 at Westwood Golf Club. Click here to register. The next event on the Junior Tour schedule is the Cobra-Puma Junior Cup Matches. This year’s Junior Cup Matches will be held at the Burlington Golf Club. This Ryder Cup Format Tournament features the top players from the 2017 Iowa PGA Player of the Year point list facing off against the Gateway PGA Junior Tour. Click here for more information. 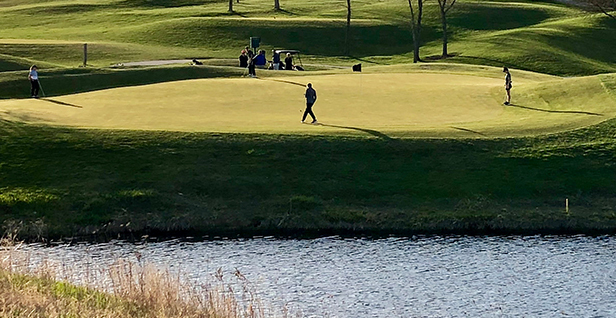 To keep up with all the Iowa PGA's news and updates please visit IowaPGA.com or visit the all new IowaPGAJuniorGolf.com website, and follow us on Facebook, Twitter and Instagram.